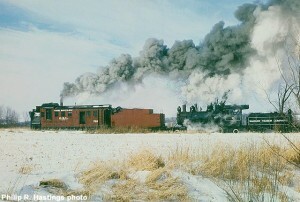 OSL #762 in action at Snow Train 1985. Philip R. Hastings photo, MCRM collection. #762 in service, February 1985. 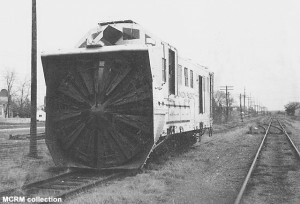 The ultimate weapon in the railroad snow-fighting arsenal is the rotary snow plow. 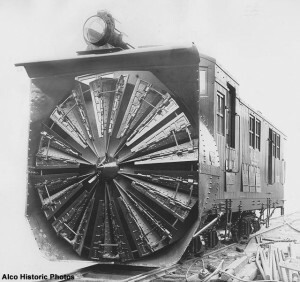 The first concept of a machine railroad snow plow was conceived by a Toronto dentist named J.W. Elliot in 1869. Resembling a fan mounted on a freight car truck, a prototype was never built. Other inventors proposed variations, but Canadian Orange Jull was the first to develop a practical design and contracted with John and Edward Leslie, owners of a machine shop in Orangeville, Ontario to construct a full-size working model. 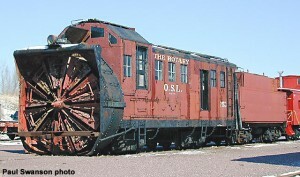 The new “rotary” consisted of a wheel with two rows of tilting blades which chopped up snow and drew it into a second rotating fan which threw the snow clear of the track through an overhead chute. The wheel and fan were driven by a pair of steam cylinders receiving steam from a boiler mounted on the same carbody. The plow required a locomotive to push it through the snow. The prototype was ready by April 1884 and tested briefly at a nearby rail yard. Patents were filed shortly thereafter. The Leslie brothers obtained manufacturing rights from Jull and formed the Rotary Steam Snow Shovel Manufacturing Company in Paterson, NJ. The Danforth & Cooke Locomotive and Machine Company at Paterson was contracted to actually construct the plows. Union Pacific bought the first three in 1887. Jull felt compelled to invent a competitor to his original design. His new Jull Centrifugal Snow Excavator was similar except a corkscrew-like apparatus broke up the snow and expelled it through a chute above. A famous snow plowing trial was held on the narrow gauge Denver Leadville & Gunnison near Alpine Tunnel, Colorado in April 1890. The Leslie’s plow emerged victorious, at least in the trade press of the time. Only eleven Jull Excavators were built between 1890 and 1892. 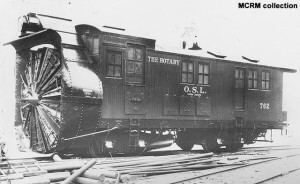 By 1900, nearly sixty Leslie-patent rotary snow plows had been built, with a few coming from Schenectady Locomotive Works, and Grant Locomotive Works (Grant was also located at Paterson). 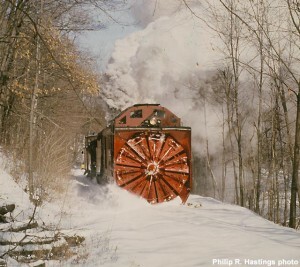 Over the years, improvements were made to the design such as a new wheel with full-width blades that resisted clogging, control of train air brakes from the plow’s cab, larger boilers, and air-actuated ice cutters and flanger. After 1903, the newly formed American Locomotive Company (through merger of several smaller locomotive manufacturers), built all of Leslie’s plows. 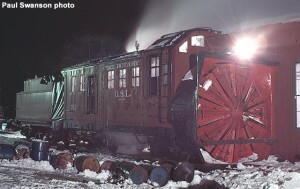 The last Alco-built Leslie was released by the Schenectady plant in December 1937 for the Northern Pacific. A total of 135 plows had been built. In 1949, Alco licensed Lima-Hamilton, another locomotive builder of the time, to build four “super rotaries.” These were to be the latest word in the Leslie design, using two three-cylinder engines similar in design to Lima’s famous Shay locomotives, roller bearings for the wheel shaft, an oil-fired boiler, and an all-steel carbody with welded steel frame. These were the last Leslie-design rotaries built new. About the same time, the Chicago Burlington & Quincy Railroad converted one of their existing steam Leslie plows to electric power by removing the boiler and steam engine and replacing with four electric traction motors from a diesel locomotive. Electricity was provided by a diesel locomotive coupled behind. Other railroads followed suit and dozens of Leslie plows were converted to electricity. 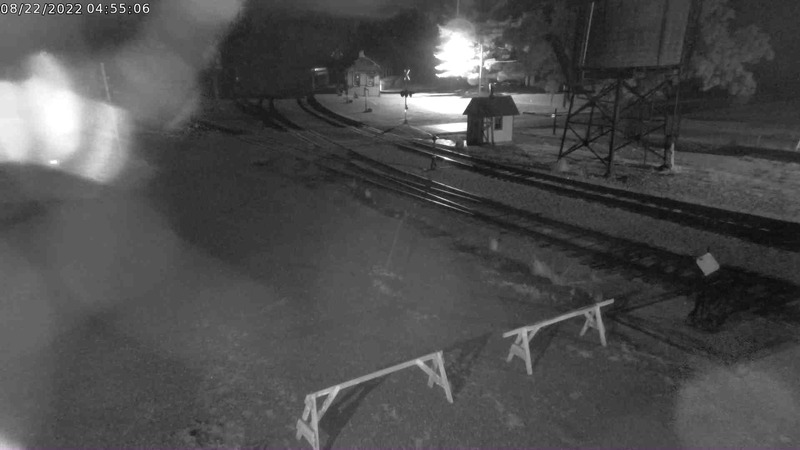 Today, a handful of electrified Leslies are held in reserve for emergency snow removal across the U.S. Perhaps a dozen of the steam version have been preserved in museums. 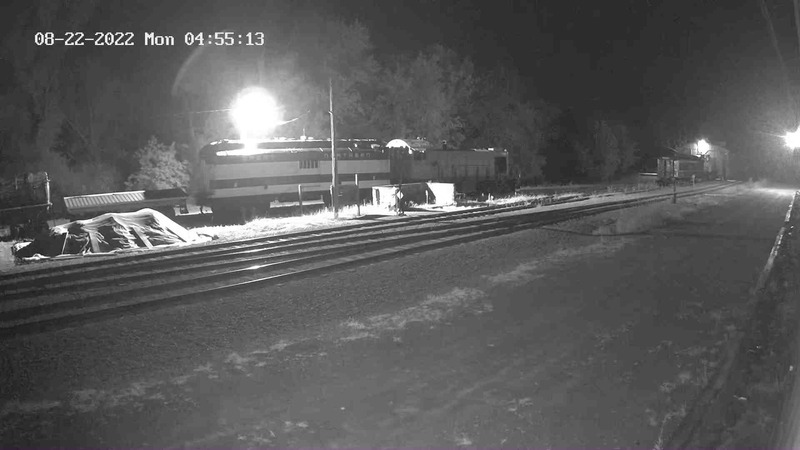 The last use of a steam-powered standard gauge rotary occurred in March 1977 on the Union Pacific and Rock Island in Colorado. The Cumbres & Toltec Scenic Railroad at Chama, New Mexico occasionally uses their ex-D&RGW narrow gauge steam rotary to open their line in the spring. The rest have been scrapped. #762 was constructed for Oregon Short Line (a subsidiary of the Union Pacific) by the Rogers Works of the American Locomotive Company at Paterson, New Jersey in 1912 using the Leslie Brothers patents. On the front of the plow is the large rotating blade (the later improved version) which throws the snow by centrifugal force through a directional chute above. An oil fired steam boiler and two steam cylinders inside the carbody power the blade. The plow requires a locomotive to propel it through the snow. The original body was wood sided. The Union Pacific later replaced this with more durable riveted steel plates. The plow was renumbered to Union Pacific #051 in 1936, and received its final number of UP #900051 at an unknown date. In 1971, the plow was retired and moved to a restaurant at Blackfoot, Idaho for display. By 1980, the owners of the restaurant no longer wanted the plow and it was donated to Mid-Continent. 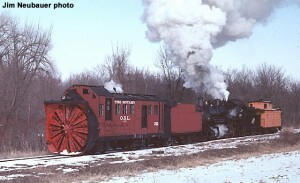 After lengthy preparations, the plow was moved on its own wheels to North Freedom along with a Vanderbuilt-style (cylindrical) former steam locomotive tender. The move was not without incident. Vandals stole parts off the plow while en route. After arrival at North Freedom, the museum restored OSL #762 to operating condition and re-lettered the body to represent its original appearance. An auxiliary tender from the museum’s steam wrecker MP #X-105 was mated with the rotary as it more closely resembled the standard tender that would have accompanied the plow when it was first built. OSL #762 operated for Snow Train 1985-87. It presently is on static display out of service. Repairs to the boiler near the steam dome are required before it may operate again.